What’s looming with the power to crush you and your family’s wellbeing, while causing work and home tension to spiral? Your business growth efforts would feel like trudging through quicksand. And it would turn your community upside-down. 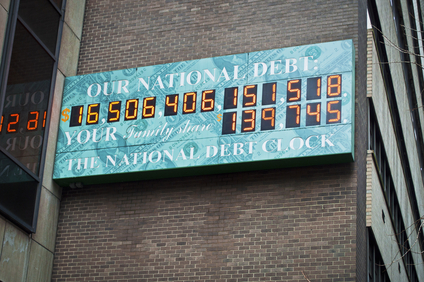 It’s our $16 trillion-plus national debt, a natural consequence of the annual federal government deficits. In 2013 we will spend 642 billion more than we take in. An economy going from bad to worse – Skyrocketing unemployment and economic shutdown driven by austerity measures most debt-ridden countries are forced to employ. Shortages of key supplies and services – Debt-ridden countries experience medical and other supply shortages. And now Greek officials fear their citizens will face cut offs in natural gas and electricity because of back payments to these providers. Ridiculously high tax rates – The new prime minister of France plans to propose a 75% tax rate. Regression in the Standard of Living – 40% of Greeks turned in their cars for bicycles because they couldn’t afford the plethora of transportation taxes. Despair – Like in the Great Depression, suicide rates climb. The numbers of abandoned babies goes up as more parents lose hope. With no hopes for employment and an inability to afford basic needs like food and shelters, desperate people in many places take to the streets, looting to get what they need. Get Your Financial House in Order Without Sacrificing Key Family Time – It’s hard to picture what life in America will look like 10 years from now should our country continue to spend more than we bring in, adding to our debt each year.Ten years is a little more than half of the life of a kid at home. Most moms don’t want to miss family time and their kids’ milestones to prepare for some abstract future economic meltdown. By being a mompreneur you can have both: connection with your family and a solid financial grounding for an uncertain future. The flexibility and freedom having a mom entrepreneur lifestyle allows you to grow your business and revenue without missing out on those important family moments. People Still Buy Things Even During Economic Downturns – The skills you develop mastering the fundamentals of business ownership can be converted to products or services that sell even during economic downturns. While your neighbors are getting their pink slips, you can be gearing up your business engine for depression-friendly products and services. You Can Earn Above Average Income When You Are the Boss. – Having a smart business model inspires you to achieve the revenue targets you set. Having surplus revenue allows you to pay off all of your debt, invest, and build a reserve that will allow you to ride out the likely waves ahead. So while our Congressmen are kicking the can months ahead—like usual—rather than coming up with a budget or intermediate term budget deficit reduction plan, know that just because we’re the most powerful country on earth doesn’t mean we’re not immune to natural law. You know if you were to outpace your income with spending year after year, your future would be desolate, too. But, be thankful 1) that financial calamity has not happened yet and it’s not too late to put pressure on our politicians to get the budget under control, and 2) that you have a mom biz that can give your family the financial wiggle room to weather the inevitable storm, should nothing changes. Catholic Mompreneur’s Biz and Life Tip: Don’t put your head in the sand about what is going on with the money in Washington. But at the same time, don’t freak. Just put your hand to the plow with your mom biz to increase your chances of a smoother ride.